There once was a time when romance was an essential part of the superhero comic formula. Heroes had love interests that they would court over time, and those relationships were often a primary source of narrative tension because of the complications introduced by secret identities. Then romance comics fell out of fashion and superheroes entered a dark and brooding mode that didn’t make much room for love. Romantic relationships became an afterthought in superhero comics, and when they were the focus, they often ended in tragedy. It’s rare to see a modern superhero series that prioritizes romance, which is why Dan Slott, Michael Allred, and Laura Allred’s Silver Surfer has been such a refreshing read for the past 12 issues. Norrin Radd is the Silver Surfer, the former herald of a world-eating being who forced Norrin to track down planets ripe for consumption. No longer enslaved to Galactus, Norrin is trying to find his path in life (a common theme for the character), and Slott explores that idea by pairing Norrin with Dawn Greenwood, a young woman from Earth who has never explored the world outside of her small hometown. They’ve explored the far reaches of the galaxy together over the course of the series, growing closer as they witnessed the vast wonders the universe has to offer, but when Dawn learned about Norrin’s genocidal past, their burgeoning relationship took a serious hit. Combining the bombast and limitless imagination of Jack Kirby’s classic Marvel work with a central relationship inspired by the Doctor/Companion dynamic of Doctor Who, Slott and the Allreds have created a Silver Surfer series that caters to both diehard fans of the hero and readers with no familiarity of the character. The focus on new character Dawn Greenwood has helped Slott ease newcomers into Norrin’s world, and he’s gradually brought more attention to Norrin’s backstory as Dawn gets to know him better. The emphasis on this personal relationship has grounded the cosmically powered Silver Surfer in relatable human emotion, but Michael Allred’s artwork with colorist Laura Allred heightens the plot with the sci-fi superhero spectacle that has defined much of the hero’s past. Silver Surfer #12 returns to more conventional plotting and layouts after an experimental issue that made outstanding use of visual structure to accentuate the central ideas of the narrative, telling the story on a Möbius strip to highlight Norrin’s never-ending dedication to a life of selflessness and compassion. Issue #11 was a spotlight for this creative team’s ambition, but this week’s issue is a smaller-scale story that spotlights the remarkable work this team has done with Dawn and Norrin’s relationship. The dedication Norrin showed in the last issue has inspired Dawn to forgive him of the sins he committed as Galactus’ herald, but she’s not quite ready to jump back onto the romantic track she was on before. Something is off about the new planet Dawn and Norrin are living on with a tribe of alien refugees, and as much as they want each other, they’re not comfortable taking the next step until they figure out what exactly is wrong. The pacing for this issue is much calmer than the last few chapters, which turned up the intensity by bringing Galactus into the book and forcing Norrin to come to terms with the tragedies he instigated in the past. That’s all over now, and Dawn and Norrin are using this time to relax and try to get back to a place of normalcy. They’ve found happiness over the last few months, but unfortunately that’s where the problem lies. The planet they’ve been living on is actually called Euphoria, and it has hijacked the minds of all its residents to give them a totally content lifestyle. Dawn and Norrin both sense something is wrong, and even though the planet is pushing them together for a climactic kiss, they can’t make it happen because of this uneasy feeling. Euphoria’s influence on Norrin and Dawn works as a metaphor for writers that push characters into romantic relationships rather than letting affection develop organically; it’s been clear from the start that Dawn and Norrin would eventually end up together, but Slott hasn’t rushed to get to that point. Instead, he’s made sure that these characters understand each other as friends before they become lovers, so when the inevitable romance does blossom, it has a strong emotional foundation. The big moment finally happens when Dawn and Norrin break free from Euphoria’s influence and decide to make their way back to Earth. Dawn thanks Norrin for not kissing her, telling him that she doesn’t want to kiss him when a planet wants her to, but when she wants to, and then plants a big kiss on his lips for a full-page final splash that has been over a year in the making. It’s a triumphant conclusion to the issue, and the visual of Dawn and Norrin kissing against a cosmic background is the perfect encapsulation of everything that makes this book so wonderful. As engaging as Slott’s writing is for this title, the main attraction of Silver Surfer is Michael and Laura Allred’s artwork, which scored both creators Eisner Award nominations this year. Each issue has been a stunning display of Michael Allred’s talent for designing a wide variety of alien characters and environments, and Laura Allred’s vibrant palette makes everything more fantastic by coloring these otherworldly elements in bright pastels and neons. Silver Surfer is a book that is brimming with imagination and color, giving the Allreds free rein to create intricate, inventive imagery that pushes their boundaries as visual storytellers. The first image of this issue is a haunting shot of Silver Surfer floating in sea of dead bodies left in the wake of his former master Galactus, and all the various elements of this image combine to give this opening a much bleaker feeling than the rest of the story. Leaving Galactus in silhouette except for his red eyes reinforces the idea that he’s primarily responsible for the darkness and destruction in Norrin’s life, but the whiteness of Silver Surfer indicates how Norrin has broken free from Galactus’ influence and become an opposing force to the world-eater. Finally, the floating blue bodies create visual tension against the bold red background, reflecting the inner turmoil within Norrin that has caused him to have this nightmare. The first image is all about terror, but once Norrin wakes up, the art becomes much more joyful and inviting. The title page showing Norrin walking through the alien settlement is full of life, and there’s a strong sense of community in the image, from the shots of parents interacting with their kids in the background to the pairs of children holding hands in the foreground. It’s easy to linger on these group shots thanks to the lush design work, and readers should take their time to appreciate the fine details that make the art especially immersive. The Allreds have clearly spent a lot of time creating the foliage and wildlife of this world, and that level of specificity is one of the reasons why Silver Surfer has some of the best art in superhero comics. Allred is a master of facial expressions and body language, which come in handy when showing the push-and-pull of Dawn and Norrin’s attraction to each other. One of the subtler details is Dawn’s hair, which is used as a type of wave that brings the two together, then draws them apart. When Dawn and Norrin are lying on the grass, staring into each other’s eyes, Dawn’s hair reaches toward Norrin like tentacles, but as the two faces get closer together, the hair moves away to foreshadow that it’s not the right time for a kiss. In the second kiss fake-out scene, the hair plays the same role, but because it’s tied back in a braid, there are just a few strands that move toward and away from Norrin. It’s a very small detail, but it’s a clever visual indicator of the undeniable force that is pushing these two people together. Dawn and Norrin are getting together just in time for Silver Surfer to end with the rest of Marvel’s ongoing titles during Secret Wars, and it’s uncertain whether or not Slott and the Allreds will continue their run when Marvel relaunches all its books in the fall. The status of Dawn and Norrin’s relationship in the future is also a mystery, but hopefully Marvel won’t abandon all the excellent character development that has come out of this run. 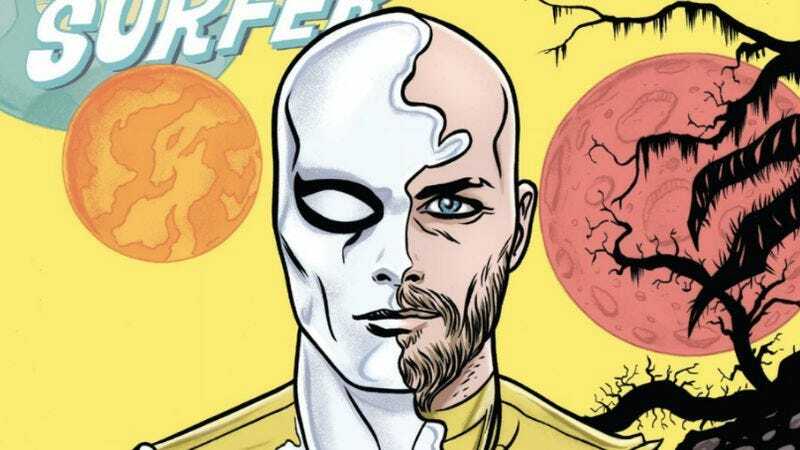 This creative team has created a stand-out superhero title by building a captivating romance for Silver Surfer, and this relationship deserves more time to thrive and grow, even without Slott and the Allreds at the helm.